High Sierra Wheeled Carry-On Boot Bag lets you skip the checked baggage line at the airport. Want to travel like the U.S. Ski Team on your next ski trip? 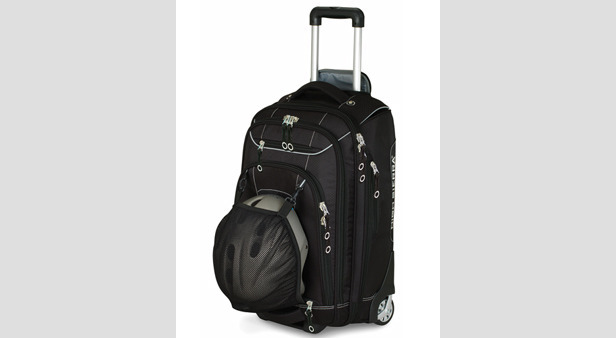 Then check out the High Sierra Wheeled Carry-On Boot Bag and skip the checked baggage line at the airport. This bag features rugged, corner-mounted wheels, a telescoping lightweight (but strong) aluminum handle and hidden padded pack straps so you can wear the bag on your back. The large main compartment has plenty of room for ski or snowboard boots (up to a size 13) and can be expanded an additional 2.25 inches to fit more gear like hats, gloves, socks and more. There are outside pockets for carrying everything from additional gear to a laptop. A tuck-away mesh flap is hidden in a zippered pocket and can be used to hold a helmet on the outside of the bag. One great advantage that this boot bag has is that it can just as easily be used as a wheeled carry-on bag for non-ski trips. Leave the ski boots at home and fill it with sandals and swimsuits for your next warm-weather vacation. One drawback to this boot bag is the price, but the versatility of being able to use it as a standard wheeled carry-on when you’re not lugging ski or snowboard boots gives it more value than your average ski boot bag. Plus, wheeling around the same boot bag that U.S. Ski Team athlete Travis Ganong uses on the World Cup tour might just make you ski faster.